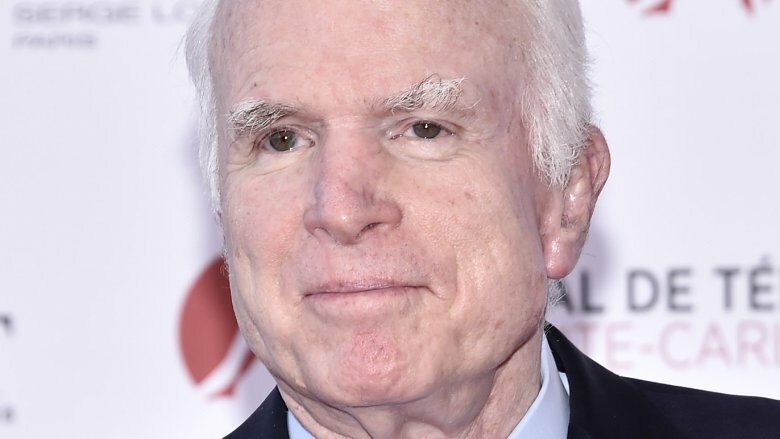 Senator John McCain has sadly passed away following a longtime battle with brain cancer. On Saturday, Aug. 25, 2018, the Republican politician's office confirmed to The New York Times that McCain died at 4:28 p.m. while surrounded by his loved ones in his Arizona home. He was 81 years old. McCain's daughter and The View co-host, Meghan McCain, shared the news on Twitter that evening. "My father, United States Senator John Sidney McCain III, departed this life today. I was with my father at his end, as he was with me at my beginning," she wrote, in part, in a lengthy text-post, which she captioned with, "I love you forever – my beloved father." "In the thirty-three years we shared together, he raised me, taught me, corrected me, comforted me, encouraged me, and supported me in all things. He loved me, and I loved him," her statement continued. "He taught me how to live. His love and his care, ever present, always unfailing, took me from a girl to a woman — and he showed me what it is to be a man. All that I am is thanks to him. Now that he is gone, the task of my lifetime is to live up to his example, his expectations, and his love." She added, "My father's passing comes with sorrow and grief for me, for my mother, for my brothers, and for my sisters. He was a great fire who burned bright, and we lived in his light and warmth for so very long." Meanwhile, Cindy McCain, his wife of 38 years, also mourned his death on Twitter, writing, "My heart is broken. I am so lucky to have lived the adventure of loving this incredible man for 38 years. He passed the way he lived, on his own terms, surrounded by the people he loved, in the the place he loved best." As Nicki Swift previously reported, Sen. McCain was diagnosed with glioblastoma in July 2017. At the time of his diagnosis, he'd undergone a procedure to remove a blood clot from above his left eye at the Mayo Clinic Hospital in Phoenix, Ariz.
On Friday, Aug. 24, 2018, the McCain family released a statement on his behalf, announcing his decision to suspend his brain cancer treatment. "Last summer, Senator John McCain shared with Americans the news our family already knew: he had been diagnosed with an aggressive glioblastoma, and the prognosis was serious," their statement read, in part (via CBS News). "In the year since, John has surpassed expectations for his survival. But the progress of disease and the inexorable advance of age render their verdict. With his usual strength of will, he has now chosen to discontinue medical treatment." For over 30 years, the Republican maverick and Vietnam War hero, who famously ran against former President Barack Obama in 2008, had represented the state of Arizona in the Senate. After news of McCain's passing broke, a number of celebrities and his former colleagues took to social media to mourn the loss of the longtime politician while expressing their thoughts, prayers, and condolences. "John McCain and I were members of different generations, came from completely different backgrounds, and competed at the highest level of politics," Obama tweeted in a lengthy statement on behalf of himself and former First Lady Michelle Obama. "But we shared, for all our differences, a fidelity to something higher — the ideals for which generations of Americans and immigrants alike have fought, marched, and sacrificed." He went on, "Few of us have been tested the way John once was, or required to show the kind of courage that he did. But all of us can aspire to the courage to put the greater good above our own. At John's best, he showed us what that means. And for that, we are all in his debt." Meanwhile, former Vice President Joe Biden tweeted, in part, "John was many things — a proud graduate of the Naval Academy, a Senate colleague, a political opponent. But, to me, more than anything, John was a friend. America will miss John McCain. The world will miss John McCain. And I will miss him dearly." McCain recently reflected on his life and career in his May 2018 memoir, The Restless Wave. "It's been quite a ride. I've known great passions, seen amazing wonders, fought in a war, and helped make peace. I've lived very well and I've been deprived of all comforts. I've been as lonely as a person can be and I've enjoyed the company of heroes. I've suffered the deepest despair and experienced the highest exultation," he wrote in one passage (via CNN). McCain added, "I made a small place for myself in the story of America and the history of my times." According to Entertainment Tonight, McCain is survived by his wife, Cindy, and his five children: Sidney, 50, Meghan, 33, John, 32, James, 30, and Bridget, 27. Our thoughts are with Senator John McCain's loved ones during this difficult time.